If you wish to travel from Osaka to Fukuoka, you can take the shinkansen or a plane, or even ride a ferry. In this article we compare these means of transportation in what regards travel time and costs. Fukuoka is 403 kilometers in straight line distance from Osaka. It's a city that has become the gateway to the Kyushu region. Hakata Station is a terminal station of the Tokaido Sanyo Kyushu Shinkansen, and Fukuoka Airport is located adjacent to the city area. Both facilities have subway lines running into them and are easy to access. The city is appropriately located to be called the transportation hub of Kyushu. Local cuisine is popular with international visitors, especially the famous Hakata ramen. These local cuisines can be found and enjoyed in places like Nakasu, an entertainment district famous for its yatai food stalls. Fukuoka also boasts many large shopping facilities with easy access, such as the Hankyu department store, which is adjacent to Hakata station. Two stations away is Canal City Hakata. Go one more station and you'll find the popular district Tenjin. The most popular way to travel is by shinkansen (bullet train). Visitors can travel from Shin-Osaka Station directly to Hakata station without any transfers. The fare is 14,480 yen for a one-way non-reserved seat ticket, and the ride will take you about 2.5 hours. You can choose from the Nozomi, Hikari and Kodama trains, as well as the JR West-exclusive Sakura and Mizuho trains. There is also the special Evangelion Shinkansen running one round trip every day until March 2017. This special shinkansen departs from Shin-Osaka at 11:32 AM, and all seats are non-reserved. The fastest means of transportation is by plane. There are two airports in Osaka: Osaka International Airport (Itami Airport) and Kansai International Airport. It's a little over one hour from Itami Airport to Fukuoka Airport. A total of 10 flights by JAL, ANA, and IBEX are available every day. The fare ranges from 13,400-27,000 yen. From the Osaka city area to Itami Airport, you'll first want to get to Hankyu Umeda station. From there you'll ride the Hankyu Line to Hotarugaike station, and transfer to the Osaka Monorail to Itami Airport. The ride should take around 30 minutes, and cost 420 yen. Flights by ANA, JETSTAR, and PEACH depart from Kansai International Airport to Fukuoka Airport. There are a total of about five to six flights daily. The number of flights is somewhat less than Itami Airport, but because some of the carriers are LCCs (low cost carriers), the lowest price for a ticket can start at 3690 yen. In order to reach the Kansai International Airport, you will ride the Nankai Railway from Namba station to Kansai International Airport station. The fare is 920 yen, and the ride will take you about an hour. Itami Airport is easier to access and has more daily flights, while the Kansai International Airport offers cheaper tickets. You can also travel from Osaka to Fukuoka by ferry. There is regular ship service from Osaka Nanko Port to Fukuoka's Shin-Moji Port. Reservations can be made on the internet from Meimon Taiyo Ferry's website, but you can also get tickets on the day you're traveling at the ticket office. To reach Nanko Ferry Terminal, you can ride a bus from one of the stations below, as well as from the airport. The fare is 500 yen for a one-way ride for an adult. A one-way ferry ride fare starts at 4460 yen. There are two ferries departing every day. They leave at 5 PM and at 7:50 PM, and arrive at 5:30 AM and 8:30 AM of the following day, respectively. The trip being a night cruise, you will be able to enjoy the sight of the lit up Akashi Kaikyo Bridge, the Great Seto Bridge, and Kurushima-Kaikyo Bridge. The next morning you will pass through the Kanmon Straits and arrive at Moji Harbor. Despite its low price, traveling by sea allows visitors to enjoy the views of the sea, unlike the mountains and tunnels seen from the shinkansen, and we highly recommend the experience. From Moji Port to the Fukuoka city area, you can use the Shinkansen from Mojiko station (JR) → Kokura (Shinkansen) → Hakata in about 40 minutes. The fare is 2330 yen. Combined with the ferry, the total transportation cost is 6790 yen. If you travel by the conventional lines from Mojiko → Hakata, it will take you about an hour and a half, and will cost you 1470 yen, for a total of 5930 yen. This is a great price for a cruise from Osaka Nanko Port through the Seto Inland Sea to Moji Port for a 12-hour journey on the sea. 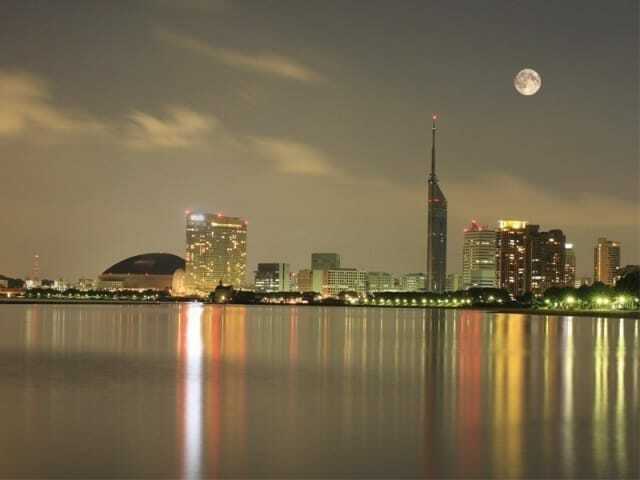 You can also travel from Osaka to Fukuoka by Express Night Bus. You'll be traveling by night and saving time, as well as saving money. The price can be more than 10,000 yen cheaper than the Shinkansen, at around 4000-12,000 yen. The ride takes about 8 hours. Night buses will depart from Osaka around 9 PM, and arrive the next morning between 6-8 AM. More than 10 buses depart from the bus terminal in Umeda, Osaka, run by Zenkoku Kosoku Bus, Royal Express, Nishinihon Tetsudo Bus, and Willer. You can also choose your destination from Hakata Station, Nishitetsu Tenjin Bus Terminal, and Nishitetsu Kurume Station East Exit. Choose the one that best fits your travel plans and enjoy all that Fukuoka has to offer! 5 Great Ways To Experience Japan's Culture, Fukuoka-style!